• 2x Ø6mm-U-shape copper heat pipes accelerate heat conductivity. • Simple installation procedure design. • Universal socket support:Intel115X/775,AMD K8/AM2/AM3/FM1/FM2. • 9225 white designed fan,fan speed up to 2200rpm.efficiently optimizes cooling performance. 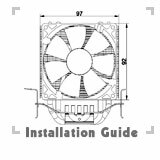 • Option for adding 2nd fan to increase cooling power. ← Venti-HPQ12025 AMD Socket AM2, AM2+, AM3,AM4, FM1.